What pattern connects the crab to the lobster and the orchid to the primrose and all four of them to me? And me to you? It’s hard to talk about God. Impossible to name the Nameless. 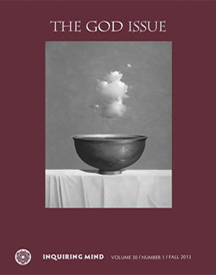 “The Tao that can be spoken is not the eternal Tao.” Yet in The God Issue, that’s what we’re asking of ourselves and our contributors: Can a Buddhist believe in God? Can a Christian, Jew or Muslim who also practices Buddhism reconcile the two traditions? How might a relationship with God enrich or conflict with one’s Buddhist practice? There are countless notions of God. There is the God of Abraham and Isaac, of Jesus and Mary; there is Mohammad’s Allah and the Yorùbá Olódùmarè. Recall the Hindu Trimūrti—Brahma, Shiva and Vishnu—or our indigenous people’s Great Spirit. There is the Goddess in her countless manifestations, and of course, let’s not forget the Higgs boson and all things quantum. At nineteen, I encountered the Four Noble Truths and the concept of dependent origination, which revolutionized my worldview and changed my feeling about God. I came to understand God as a kind of Emptiness. God is neither a groovy nor grim character overhead, directing the world stage. God is light-years beyond fathomable! Still, after twenty years of vipassana practice, I notice that in my heart of hearts I talk to God like a person. I plead for guidance. I use human words in seeking this nonentity—this emptiness beyond the sum of all our parts—hoping for connection. I pray to what I cannot comprehend, believing that something out there can hear me. I accept that what is “out there” is also in here, in me, and is called by many names: God, Buddhanature, Atman/Brahman . . . or by no name at all. On my altar you will find the cherrywood Buddha I received in Korea and a miniature icon of St. Thérèse. There is no internal struggle when I sit down before these objects. The Buddha taught suffering and the end of suffering. Jesus preached total self-emptying. It seems to me they weren’t saying such different things. At my altar, there is nothing to reconcile—symbol and myth are tools for making sense of the Unknown. Susan Moon, Barbara Gates and I have marveled at the complex responses of our contributors. We fall in a long line of humans who have craned their necks toward the dark canopy of stars and wondered. We invite you to join us, as Buddhists wondering together about the unnameable, which some of us call God.